The race is tightening. Six new polls in Florida show Kerry leading in 1 poll, Bush leading in 3 polls, and two being exact ties. Excluding the Gallup poll for the moment, the average of the other five polls (Insider Advantage, Rasmussen, Strategic Vision, Survey USA, and Zogby) is Kerry 47% and Bush 48%, a statistical tie. The Gallup poll shows Bush ahead 51% to 42%, giving Bush a lead far outside the margin of error. Could Gallup be right and everyone else wrong? Who knows, but remember that in 2000 Gallup was way off, greatly underestimating Gore's vote. I'm inclined to believe the other five and say Florida is tied. Three new polls in Ohio show a statistical dead heat there too. When many polls for the same state come in on the same day, the rule is the poll with the most recent middle date wins, with ties being broken in favor of the shortest one. 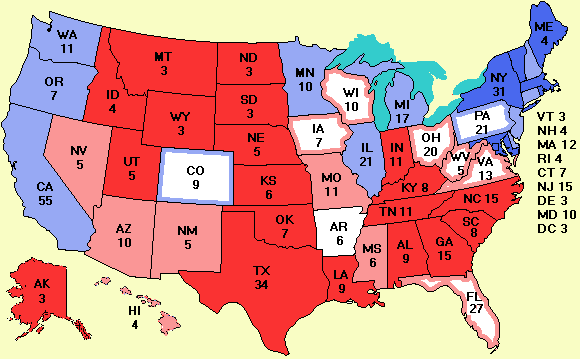 The first entry for each state in the Polling data file listed next to the map shows the one used on the map. A new poll in Nebraska answers that age-old question: could Nebraska split its votes in the electoral college with a resounding: NO! Bush has huge leads in all three congressional districts. Similarly, Kerry is way ahead in both of Maine's congressional districts and the Colorado referendum is behind. Looks like it is going to be winner-take-all in every state. The future belongs to the young. And maybe the election, too. Gallup did a survey among first time voters and determined that they prefer Kerry to Bush by a huge margin, 50% to 35%. First time voters are primarily in the 18-29 year age range. This is the same population that may have been undersampled in the polls because many of them have only a cell phone and no landline. Zogby's tracking poll, which breaks down the results by demographic group, shows a similar result. Young (18-29) voters have markedly different preferences than the population as a whole. In six of the ten states surveyed, Kerry leads by double digits. These are Colorado (32%), Florida (22%), New Mexico (28%), Pennsylvania (15%), Wisconsin (16%), and Michigan (32%). In Nevada Kerry's lead is 8%. Bush leads among younger voters in two states: Iowa (4%) and Minnesota (20%). The latter number defies all reason. I wonder if it was a typo. Maybe if enough people ask Zogby to double check this, we'll find out. But the conclusion is clear: if younger voters break with tradition and actually vote in large numbers this time, it could swing the election. Senate news: A new poll in Kentucky shows Dr. Daniel Mongiardo has closed the gap with incumbent Sen. Jim Bunning. Mongiardo is only 1% behind in the latest Garin Hart Yang (D) poll. All in all, the projected Senate is 50 Republicans, 48 Democrats (counting Jeffords as a Democrat) with tossups in Florida and South Dakota. Supreme Court news: Chief Justice William H. Rehnquist, 80, has thyroid cancer and had an emergency tracheotomy at Bethesda Naval Hospital according to a report in today's Washington Post. Thyroid cancer has several forms, but all are difficult to treat in older patients according to medical experts. Rehnquist is not the only member of the Court to have been diagnosed with cancer. Ruth Bader Ginsburg, 71, had colon cancer, Sandra Day O"Conner, 74, had breast cancer, and John Paul Stevens, 84, had prostate cancer. This latest occurence of cancer once again spotlights the age of the current justices and the fact that the next president is almost certainly going to have multiple vacancies to fill, probably including the Chief Justice. With respect to judicial apppointments, it is harder to imagine two candidates whose judicial appointments would differ more than Bush and Kerry's. Will the next president appoint Justices determined to reverse Roe v. Wade or to reaffirm it? What about teaching of creationism in schools, separation of church and state, medical research using stem cells, and so many other issues on which the candidates differ? Ultimately, practically all of them end up in the Supreme Court. Ten years from now the war in Iraq will be over (hopefully), but the justices the next president appoints will still be on the Court making decisions that affect many aspects of life in America. Think carefully about this issue before voting next Tuesday. Or earlier. In many states, it is possible to avoid standing in line next Tuesday by casting your vote early, either in person or by absentee ballot. If you wish to vote early ask your county clerk if early voting is an option in your area. Also, if you try to vote, either early or next week, and you are not on the voting list, be sure to ask for a provisional ballot. With such a ballot you can cast your vote anyway and the election officials will determine your eligibility after the polls close. If you are indeed eligible to vote, your vote will be counted.